Rodney Agatupu Anoaʻi (October 2, 1966 – October 23, 2000) was an American professional wrestler who is best known for his time with the World Wrestling Federation (WWF) where he wrestled under the ring name Yokozuna. The name was a reference to the highest rank in professional sumo wrestling in Japan. Although the Yokozuna character was portrayed as a champion sumo wrestler, Anoaʻi never competed as an actual sumotori. 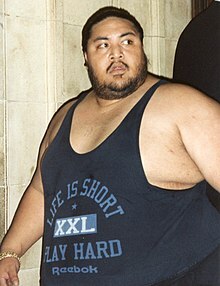 Though Yokozuna wrestled as a representative of Japan, in real life Anoaʻi was Samoan American and was accordingly billed as hailing from Polynesia. However, he was managed by the Japanese character Mr. Fuji (in reality a Japanese American), who would follow Anoaʻi to the ring with a wooden bucket of salt, and waving a Japanese flag. In the WWF, Anoaʻi was a two-time WWF World Heavyweight Champion and two-time WWF Tag Team Champion (with Owen Hart), as well as the winner of the 1993 Royal Rumble. Anoaʻi was the first wrestler of Samoan descent to hold the WWF World Heavyweight Championship as well as the first Royal Rumble winner who as a result of a direct stipulation received a WWF's world championship title shot at WrestleMania. He defeated WWE Hall of Famers Bret Hart and Hulk Hogan, in consecutive pay-per-view victories in the main event of WrestleMania IX and the 1993 King of the Ring, to win his two WWF World Heavyweight Championships, and also headlined WrestleMania X against Hart. He was the third fastest newcomer after Brock Lesnar and Sheamus to win the WWF or WWE Championship after his debut. Anoaʻi was posthumously inducted into the WWE Hall of Fame in 2012. Anoaʻi's career in professional wrestling began as he grew up in a family full of wrestlers, the Anoaʻi family. His uncles were The Wild Samoans, Afa and Sika, who trained him from an early age in the family business. Anoaʻi took on the name of the Great Kokina while wrestling overseas in Japan. He also spent some time in Mexico, learning the craft and gaining the experience necessary to be a star in the sport. He made a one time appearance for Jim Crockett Promotions on August 12, 1987, when he faced Ron Simmons at a house show. His first major exposure in the United States came in the American Wrestling Association (AWA) as Kokina Maximus. Wrestling as a Samoan superstar, he was managed by Sheik Adnan El Kassey. In storyline, he was responsible for the breaking of Greg Gagne's leg and ending his career. In 1991, when Anoaʻi was known as Kokina Maximus, he was billed as the biggest Samoan wrestler ever. In 1992, Anoaʻi was contacted by Vince McMahon of the World Wrestling Federation (WWF) and offered a roster spot along with The Samoans (Fatu and Samoan Savage). On an August 17, 1992 episode of Prime Time Wrestling the Samoans (soon to be the Headshrinkers) made their debut. Commentator Gorilla Monsoon made mention of another, larger Samoan that they would soon be seeing in the WWF. Anoa'i would make his initial debut as Kokina in an untelevised match on September 1, 1992 at a WWF Superstars taping in Hershey, Pennsylvania. Wrestling as Kokina, he defeated Ron Neal. This would be the only time that Anoa'i wrestled under his former gimmick. Shortly after he was offered a new gimmick: Yokozuna. Managed by Mr. Fuji, Yokozuna debuted on the October 31, 1992 edition of Superstars and portrayed a sumo wrestler competing under the Japanese flag. He wore a sumo thong as part of his ring attire, but wore long tights underneath the thong, something that Vince McMahon and Yokozuna's own cousin Rikishi later felt that wasn't needed and that he should've worn the traditional sumo thong without the tights. (Something Rikishi himself would later do.) He made his pay-per-view debut at Survivor Series, easily defeating the much smaller Virgil with his huge weight advantage. Yokozuna's career soon took off, and he headed into 1993's Royal Rumble, where he was billed as a potential favorite. He eliminated Randy Savage to win the Royal Rumble match, cementing his movement towards main event status. Yokozuna was a competitor in the first ever match in Monday Night Raw history, defeating the much smaller Koko B. Ware with his signature finisher, the Banzai Drop. Soon after, Yokozuna was challenged by American patriot "Hacksaw" Jim Duggan, who aimed to be the first man who could knock Yokozuna off his feet (this was taped before Randy Savage knocked down Yokozuna at the Royal Rumble). On the February 6, 1993 airing of Superstars, Duggan succeeded in knocking Yokozuna down, only for Yokozuna to then sneak attack Duggan with a bucket of salt Mr. Fuji had brought to the ring, and crush him with four Banzai Drops, the fourth being with the American flag draped over Duggan. Afterwards, Duggan was suffering from (kayfabe) internal bleeding. On the May 10, 1993 edition of Monday Night Raw, Yokozuna served as one of the lumberjacks in a match between Duggan and Shawn Michaels for the Intercontinental Championship. Duggan, upon seeing Yokozuna, immediately charged at him and knocked him off his feet again; late in the match, after Bam Bam Bigelow distracted Duggan, Michaels attacked the challenger from behind and threw him out of the ring to where Yokozuna was standing. Yokozuna knocked Duggan to the floor and nailed him with a leg drop, then rolled his unconscious body back into the ring as payback for the earlier attack. Yokozuna's next challenger was The Undertaker. The two first squared off against each other as parts of their respective teams at Survivor Series. Prior to the match starting, the two stood nose-to-nose as a tease to the crowd as to the possibility of those two facing each other. The Undertaker, however, was not tagged into the match until after it was just him and Luger on the American Team. When the Undertaker entered, he beat down on Ludvig Borga but was knocked down by Yokozuna. Yokozuna then gave the Undertaker a Banzai Drop, but the Undertaker sat up when Yokozuna went for a second Banzai Drop. The two then brawled outside, where Yokozuna seemed to be completely over-matched. They were both eliminated by double countout. Eventually, Yokozuna was forced to accept a Casket match with the Undertaker. The match occurred at Royal Rumble, where all the odds looked to be in the Undertaker's favor. However, after a lengthy match, Mr. Fuji called out the troops, bringing a dozen heel wrestlers out to aid Yokozuna in attacking the Undertaker. After a lot of struggle (as well as damaging the Undertaker's "magic" urn), the group managed to shove the Undertaker into the casket, giving the win to Yokozuna. As they celebrated afterwards, however, a mysterious figure appeared on the Titantron, looking like the Undertaker inside the casket. He opened his eyes and said the Undertaker would not rest in peace; he then disappeared in a smoke and light show, rising to the top of the Titantron and seemingly levitating all the way to the arena ceiling. He then vanished. This storyline was used to allow the Undertaker to rest for several months to recover from lingering real-life injuries. The next night on Raw, Yokozuna faced then WWF World Heavyweght Champion Shawn Michaels for the title, teasing turning heel again. Despite using his big size, Yokozuna lost the match to Michaels. He made his final WWF appearance at the 1996 Survivor Series, still going after Vader, however he only briefly entered the match illegally and it ended with all remaining wrestlers being disqualified. For a second time, Yokozuna went to his home in Los Angeles to lose weight through exercise and dieting, being replaced by other wrestlers on a late November tour of the United Kingdom. Despite dropping a reported 100 lb (45 kg), he still could not lose enough to satisfy the WWF officials, and was not medically cleared to wrestle in some states because of his physical condition. Yokozuna was unable to pass a physical required for professional wrestlers by the New York State Athletic Commission. Anoaʻi was a member of the Anoaʻi wrestling family: Roman Reigns, Rikishi, Samu, Rosey, Manu, Umaga, and The Rock were among his cousins, The Usos were his first cousins once-removed and Afa and Sika were his uncles. He had two children, Justin and Keilani. On October 23, 2000, Anoaʻi died from pulmonary edema in his room at the Moat House Hotel in Liverpool, England while on an independent wrestling tour in Europe. At the time, it was widely reported that he died of heart failure or a heart attack, but this was later found to be incorrect due to his lungs showing severe signs of blockage due to fluid. Anoaʻi's weight at the time of his death was 580 lb (260 kg). 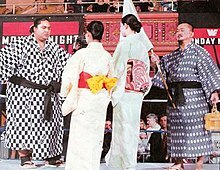 The Yokozuna Memorial Show was held in Allentown, Pennsylvania in November 2001, shortly after the first anniversary of Anoaʻi's death. It was presented by the independent promotion World Xtreme Wrestling, although matches included wrestlers from multiple promotions. On March 31, 2012, Yokozuna was inducted into the WWE Hall of Fame by his cousins, The Usos and Rikishi. ^ a b c d e f g h i j k l m n o p q r s t "Yokozuna Bio". Online World of Wrestling. Retrieved 2007-06-28. ^ a b c d e f g h i j k l m n o p q r s t u v w x y z aa ab ac "Yokozuna Bio". Accelerator 3359. Retrieved 2008-01-12. ^ a b c d e f "Yokozuna's WWE Alumni Profile". WWE. Retrieved 2018-04-30. ^ a b "WWE World Heavyweight Championship history". WWE. Retrieved 2008-04-19. ^ a b "World Tag Team Championship (WWE) history". WWE. Retrieved 2008-04-19. ^ a b c "1993 Royal Rumble match". WWE. Retrieved 2008-01-12. ^ "List of matches". www.thehistoryofwwe.com. ^ Pro Wrestling Illustrated, PWI 500 first edition, p.44. ^ Cawthon, Graham (2013). The History of Professional Wrestling: The Results WWF 1990–1999. CreateSpace Independent Publishing Platform. p. 201. ISBN 978-1-4935-6689-1. ^ "Survivor Series 1992 official results". WWE. Retrieved 2008-01-12. ^ "WrestleMania IX main event". WWE. Retrieved 2008-01-12. ^ "Yokozuna's first WWE Championship reign". WWE. Retrieved 2008-01-12. ^ "The 10 fastest rises to the WWE World Heavyweight Title". WWE. Retrieved 2018-05-31. ^ "Yokozuna's second WWE Championship reign". WWE. Retrieved 2008-01-12. ^ "Yokozuna Bodyslam Challenge results". Online World of Wrestling. Retrieved 2008-01-12. ^ "SummerSlam 1993 main event". Accelerator 3359. Archived from the original on 2007-12-22. Retrieved 2008-01-12. ^ a b "Survivor Series 1993 main event". WWE. Archived from the original on 2007-12-21. Retrieved 2008-01-12. ^ "Royal Rumble 1994 official results". WWE. Retrieved 2008-01-12. ^ "1994 Royal Rumble match". WWE. Retrieved 2008-01-12. ^ McAvennie, Mike. "Dis-Owen-ed". WWE. Retrieved 2008-01-12. ^ "WrestleMania 10 main event". WWE. Retrieved 2008-01-12. ^ "Monday Night RAW results 1994". Online World of Wrestling. Retrieved 2008-01-12. ^ "WrestleMania 21 official results". WWE. Archived from the original on March 27, 2008. Retrieved 2008-01-12. ^ "King of the Ring 1994 results". Online World of Wrestling. Retrieved 2008-01-12. ^ "Survivor Series 1994 main event". WWE. Archived from the original on 2007-12-21. Retrieved 2008-01-12. ^ "WrestleMania XI official results". WWE. Retrieved 2008-01-12. ^ "Owen Hart and Yokozuna's first World Tag Team Championship reign". WWE. Retrieved 2008-01-12. ^ "WWE WrestleMania XI (1995)". Amazon.com. Retrieved 2008-09-27. ^ "In Your House 2 results". Online World of Wrestling. Retrieved 2008-01-12. ^ "In Your House 1 results". Online World of Wrestling. Retrieved 2008-01-12. ^ "In Your House 3 results". Online World of Wrestling. Retrieved 2008-01-12. ^ "Owen Hart and Yokozuna's second World Tag Team Championship reign". WWE. Retrieved 2008-01-12. ^ "Monday Night RAW results 1995". Online World of Wrestling. Retrieved 2008-01-12. ^ "Yokozuna: From the AWA to the top". www.canoe.ca. Retrieved 2017-07-26. ^ "1996 Royal Rumble match". WWE. Retrieved 2008-01-12. ^ "WrestleMania XII official results". WWE. Retrieved 2008-01-12. ^ "Yokozuna: From the AWA to the top". www.canoe.ca. ^ "WWF Beware of Dog results". Pro Wrestling History. Retrieved 2011-05-27. ^ "WWF Beware of Dog 2 results". Pro Wrestling History. Retrieved 2011-05-27. ^ "SummerSlam 1996 results". Online World of Wrestling. Retrieved 2008-01-12. ^ "Survivor Series 1996 official results". WWE. Archived from the original on 2007-12-11. Retrieved 2008-01-12. ^ "Yokozuna: From the AWA to the top". www.canoe.ca. Retrieved 2018-05-31. ^ "This Day in Wrestling History (October 23): Cross the Line to HD". Cageside Seats. Retrieved 2016-03-22. ^ "Wrestler dies on British tour". BBC. 24 October 2000. Retrieved 16 December 2014. ^ a b "Third time charm for Bischoff?" MikeMooneyham.com "A coroner has attributed fluid in the lungs as the reason for the death of former WWF champ Yokozuna (Rodney Anoia) last October while the 750-pound Yoko was on tour in Liverpool, England. It originally had been reported that he died of heart failure." ^ "The Best of WWE Hall of Famer Yokozuna". WWE. Retrieved 2012-03-21. ^ "PWI 500 PWI Years 2003" (in French). Retrieved August 21, 2018.